* Please submit any suggestions, ideas, content, or issues in the Support Topic! It helps keep information organized. Originally created by DBurgdorf, the Info Center is a resource window for lots of different and useful information. Various information has been condensed into better suited tabs, and it has had a face lift in several ways. The window is completely re-sizable with a small minimum size. Use the EQ2 Button to open the InfoCenter. A minimize button is also included, so you can save the hassle of finding information again, and hide the window easily. The ESC will not close this window. Simply a functional update with no updated/new content. This patch makes sure the window still works with current game updates. Something missing? Post about it. 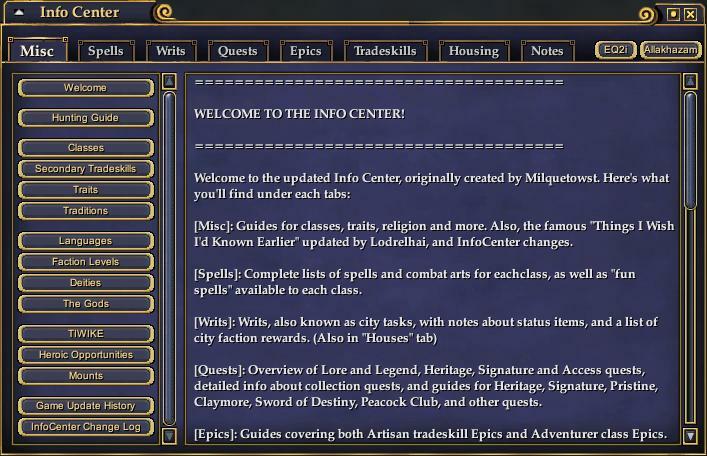 - eq2ui_custom_infocenter.xml goes in your CustomUI folder. 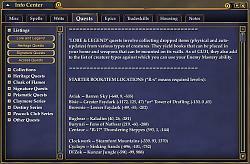 - eq2ui_mainhud_startmenu.xml goes in your CustomUI folder. 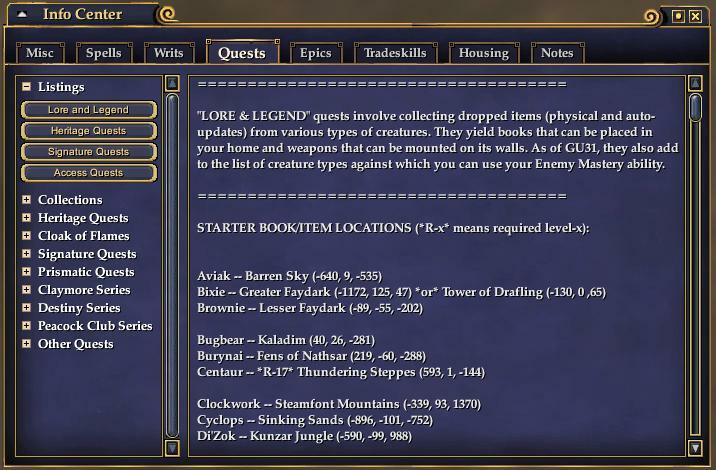 - eq2ui_custom_optional.xml goes in your CustomUI folder. - /InfoCenter/ folder goes in your CustomUI folder (retain folder structure from Zip). If you're using a UI that has the eq2ui.xml file you need to make sure that <include>eq2ui_custom.xml</include> is added to the list. - Simply a functional update with no updated/new content. This patch makes sure the window still works with current game updates. Is there a way to create a macro to access this window so that I don't have to use the Start menu? Very much out of date (last update looks like it was 2008) and wondering if any help is needed for getting it updated.... I can help gather info, but wanted to know if I put the effort out if someone would be available to update the code? I am a veteran player but a noob / non programmer :-) Also, I only have expansions through DoV.... trying to get it together for CoE and ToV but still struggling with $$ for that. Hopefully there is some interest for this wonderful tool! Feel free to submit any Updates/new content right on the drums UI forum. Just don't post it on this download page, or I'll lose track of it. Make a new topic or make a reply to any other topics. Has there been an update for this yet? I'd like to use it more it's very helpfull. If its not a pain can u make this a variant in your auto updater? I'll make both of them an optional one, just gimme some time to test it, and possibly gather updates. Last edited by Wyntakata : 07-11-2010 at 12:45 PM. ....if there is an easier way to arrange all the windows. can i simply copy a previous setup on a different character? or am i stuck moving every window, everytime i make a new toon? That command is your friend. I've been looking around and I can seem to find an answer to the questions I've been looking for. Is there a slash command for this UI pack? I seem to be missing a lot of AddOns, mostly the bar that sits along the top of bottom of the screen with your characters stats on them. I think you may have commented on the wrong UI page? This is just an Info Center addon, not a whole UI pack. No, the InfoCenter is a separate add-on. It is still compatible however.